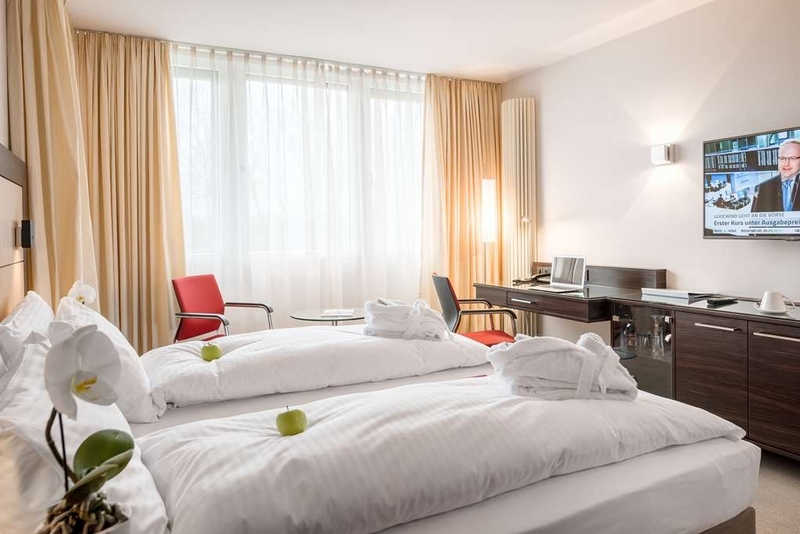 The Best Western Leoso Hotel Leverkusen is ideally located in the center of Leverkusen. Come and experience our hotel near the major tourist attractions. Best price guaranteed and exclusive deals. 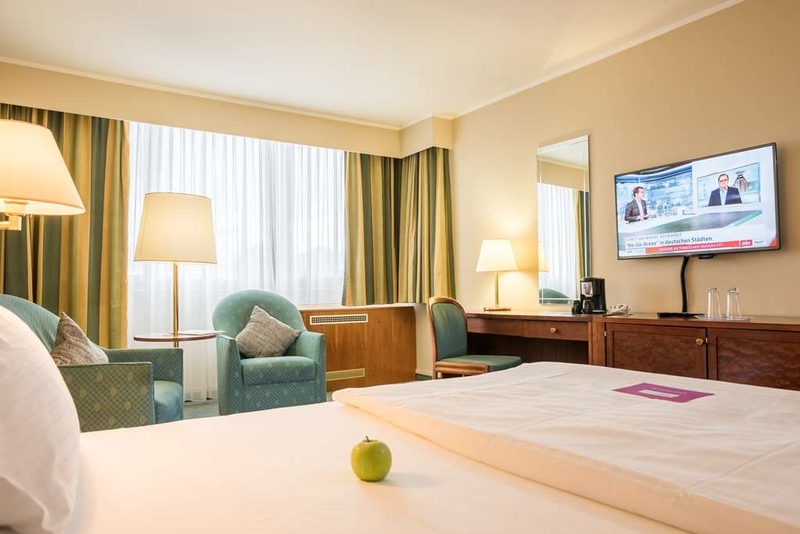 The Best Western Leoso Hotel Leverkusen with 192 comfortable rooms and four luxury suites is extremely well and conveniently located, directly by a park and in the heart of the city. 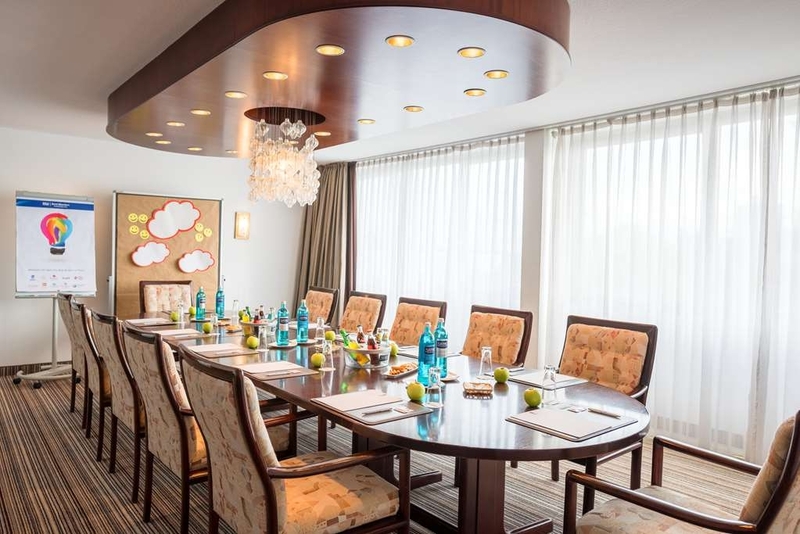 Its location couldn't be better and not just for business travelers. It's only five minutes on foot from Leverkusen-Mitte railway station and Bay Arena, directly next door to the FORUM Leverkusen Conference Center with a capacity for 2,000 people, by S-Bahn - The Trade Fair Centers in Cologne are an easy reach, only eight minutes by suburban railway and to Dusseldorf in 40 minutes. The motorways A1, A3 and A59 are only a few minutes away and there is guest parking at the hotel. Stayed here with friends. Location is good with just a short stroll to the town centre with bars and restaurants. Also close to the Bay Arena which is what we were there for. Twin rooms were a good size with two double beds. Bathroom was clean with a good shower. Check in and out was not at easy as you might expect. Bar area was nice but we didn't use the pool. Overall the experience was good but the hotel is tired and would benefit from some redecoration. "Very good hotel for business but already quite old"
"Quick booking, regrets for the whole night"
"Best way to explore Leverkusen & Koln"
Due to the good location of Best Western Leoso Hotel Leverkussen [near by train/bus station & central station] it's one of the best hotels to explore the surrounding of Leverkusen and Koln.Visit Schloss Morsbroich and the Japanese garden @Leverkusen and the famous Dom Church @Koln. "outdated - good location - good breakfast - rude"
Really bad experience ! The hotel was not clean at all and worst of everything there were mouses all over the place during our dinner. We even found traps on the floor with dead mouses inside. The drinks were extremely expensive (8.50 for a glass of very bad wine) I didn't have the courage to go to the swimming pool or to the sauna after seeing the fauna on the floor. Not recommended. I arrived at the hotel on Thursday evening with a group of 38 persons. We arrived late due to traffic problems but a meal was supplied for us which was reasonable. The only problem was that there were no spoons to eat the soup, I requested a spoon, none supplied so I ate my soup with a tea spoon. The following morning at breakfast, again there was a shortage of spoons and despite several requests I again had to eat my fruit and cereal with a tea spoon. We went out for the day, on our return that evening I went to reception and asked if I had to book a table for dinner. The receptionist was very abrupt and quite rude and looked at me as if I was an idiot. She said "No". she then turned away and ignored me. Saturday morning the breakfast was reasonable, but again a shortage of cutlery and dishes for cereal and fruit. In the evening when we returned to the hotel I again went to the reception desk to see if it was necessary to book a table as I was aware that more guests has arrived at the hotel. I was informed, again very abruptly and rudely that there was no room in the restaurant and we couldn't book any table as they were full. I pointed out that I was a resident at the hotel and I wanted a table for 4. The answer was "No you cant have a table we are full" With that the receptionist turned away and ignored me. I again asked for a table and was told we are busy, she then said " I am a receptionist go and ask in the restaurant". No joy there either so we had to go into the town to get a meal. After all,t his is a hotel and I thought that they should cater for residents. It appeared that they did not want us Brits at the hotel. It would be fair to add that our room was clean and comfortable. Nice and clean hotel with big rooms and friendly staff. 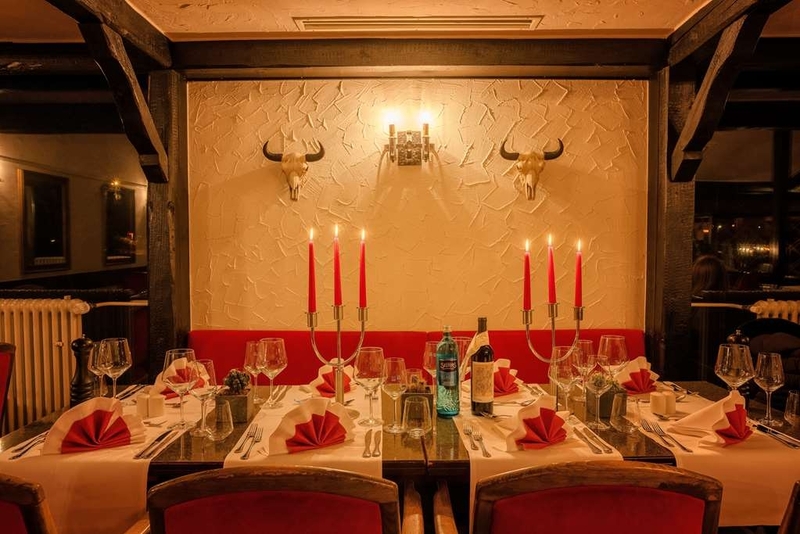 Just 10' from Leverkusen Mitte train station, and just 16' to Cologne fair ground by train. There is a mall right opposite the hotel and some nice restaurants. Also there is a steak house in the hotel. Our room didn't have aircon and fridge. Also the cost of the parking is really expensive. "Great Hotel and fantastic costumer Services/ Room service! " 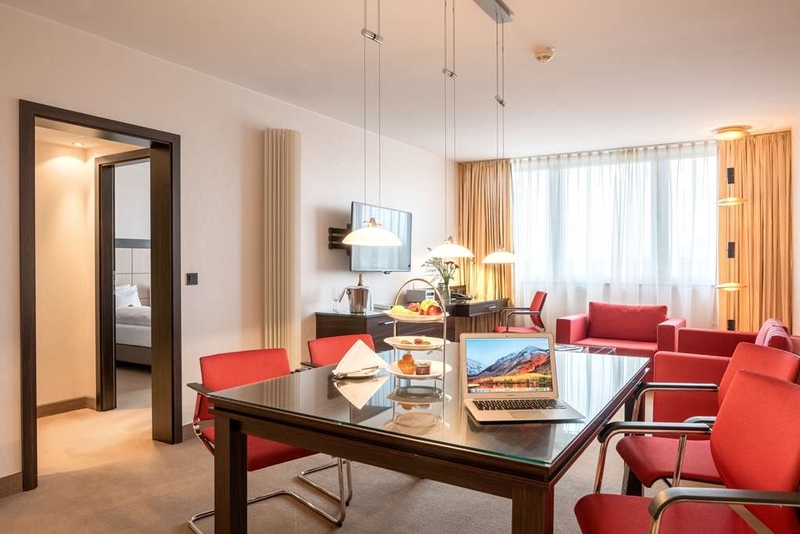 During our stay for an event in cologne the staff were extremely polite/ helpful gave us a great stay. They provided a fairly good room and give free drink in the rooms mini fridge. The room service was outstanding and cleaned out own mess changed the beds and the room was spotless, they even got our dried washing down and neatly folded it and made our room very presentable for when we came back to the room. I honestly couldn't say anything bad about this hotel or the staff. Stayed here for 2 nights. Had a very comfortable room, very large on floor 8. Very clean. The restaurant in the hotel is very good. Breakfast was a bit crowded but had plenty of selection. Railway station is close by, we visited Cologne, no hassle journey. The room would really benefit from air conditioning. The fan in the room made no impact whatsoever. "Nowhere near as bad as some would have you believe......"
Ok, so as many others have pointed out, this hotel has seen better days. However, as long as you are paying a rate which reflects that, I really don't see the problem - I have stayed in plenty of hotels in the US which I would place in a similar category. 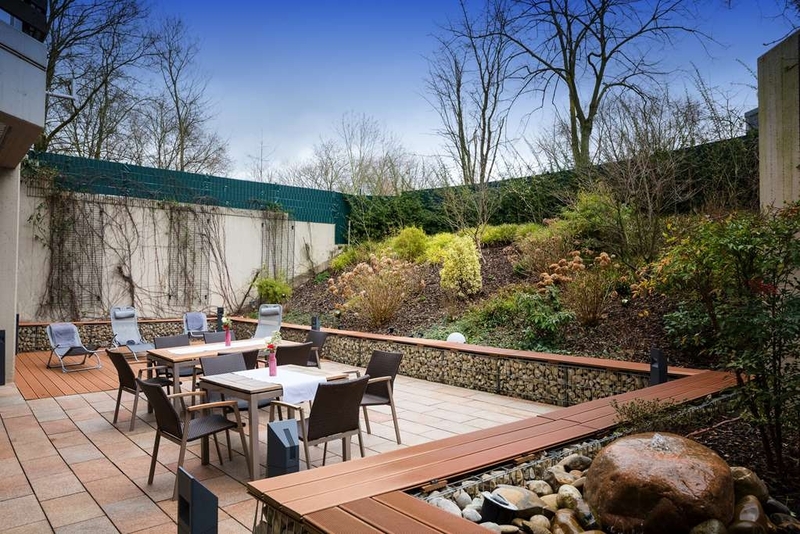 The staff are incredibly friendly and accommodating, whilst the rooms are spacious and many have two double beds, which is pretty unusual in Europe nowadays! Leverkusen is a short train ride from the centre of Cologne, where accommodation is significantly more expensive, and there are plenty of amenities a short walk away if you fancy staying closer to home. We really enjoyed our stay here and will definitely be back! We arrived on the 3 August for 3 nights in temperatures of 35C which rose to 37C over the weekend.We were greeted with the news that the hotel was to be reburished and there was no air conditioning.A portable fan had been placed in Room 623 which was next to useless.The 3 nights were horrendous-so hot it was impossible to sleep. In the room itself the beds were comfortable enough but in the bathroom the wash basin was disgraceful-badly cracked and a prime spot for germs to breed.Disgraceful. The service in the hotel too was poor to non existent-on the Sunday a group of us went for a drink at lunchtime only to be told they did not serve from the bar until 5.00pm unless we had food in the restaurant. 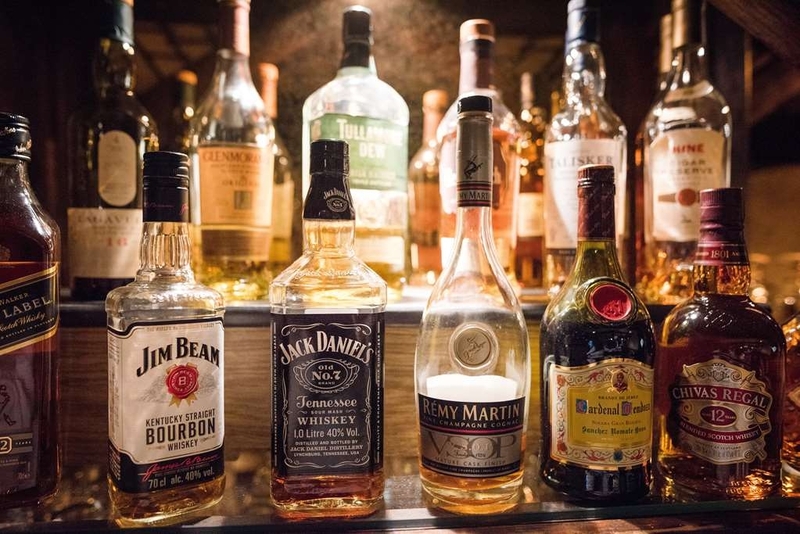 In an attempt to recompense they offered free drinks from the room mini bar but that was so miserly stocked that it was a nothing gesture, No attempt was made to advise us of the situation prior to our visit and we were made a hostage of the hotel's tardy approach to it's customers. Best Western-never again!! "No A/C just NOT acceptable"
Family with 2 teenagers. Ok transit hotel but we stayed in July and our room was sooo hot I had to sleep in the car.. We didn't have breakfast as it was as €17,- but town was nearby so we went there for food and coffee. 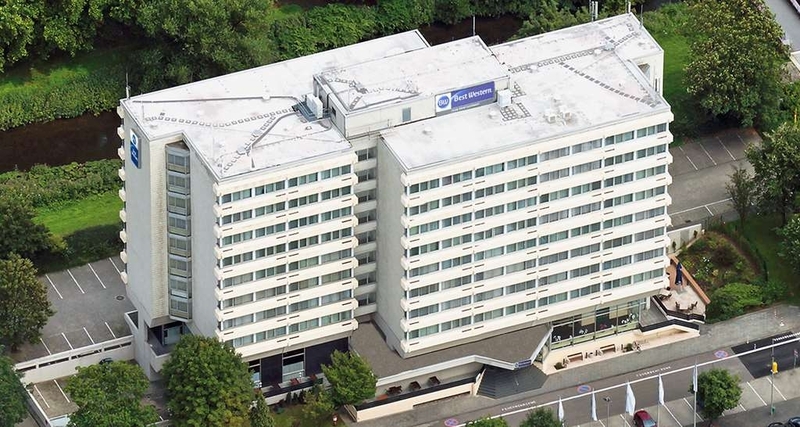 I repeatedly stay in the Best Western in Leverkusen since 2011. Usually I stay between a few days and up to a week. 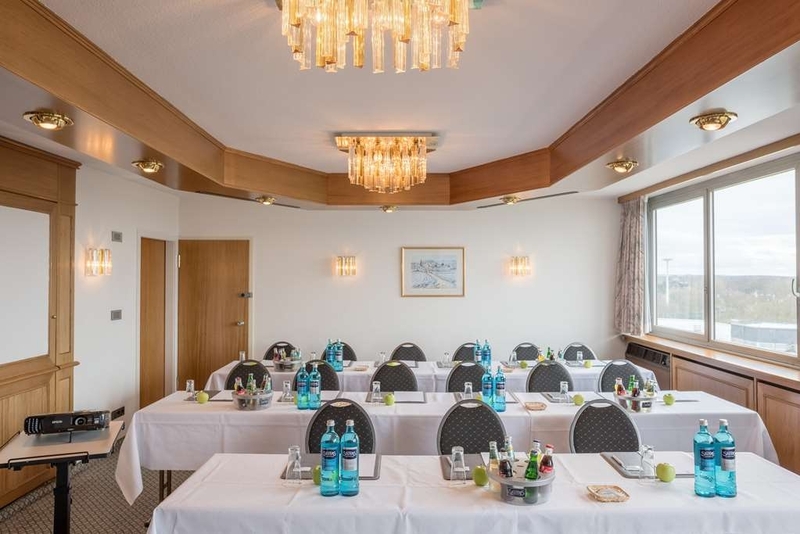 This hotel is an excellent choice when you like to be close to Cologne and surrounding area. You will see here professionals on a business trip, tour groups and even families. 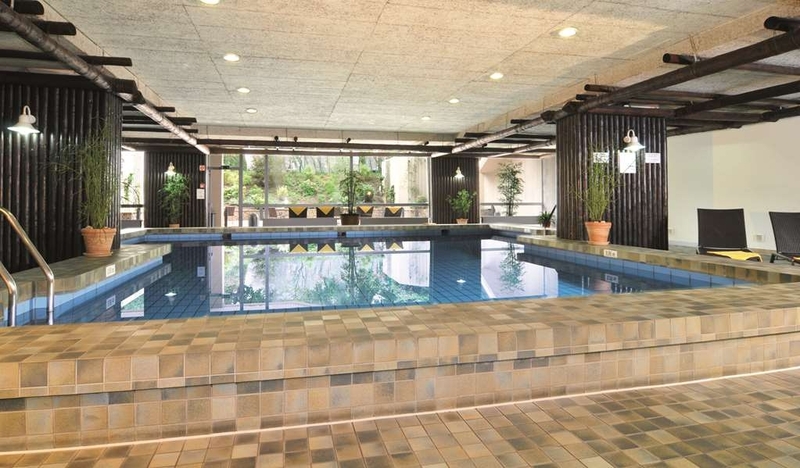 The hotel features a huge indoor pool which is located in the basement with sun loungers outside. The breakfast times are reasonable and usually between 6.30am and 10.30am. WIFI is complimentary and the reception throughout the hotel is sufficient. This hotel has a few different room types to choose from. I'm reviewing here the newly remodeled deluxe and business suites which have a separate bedroom. 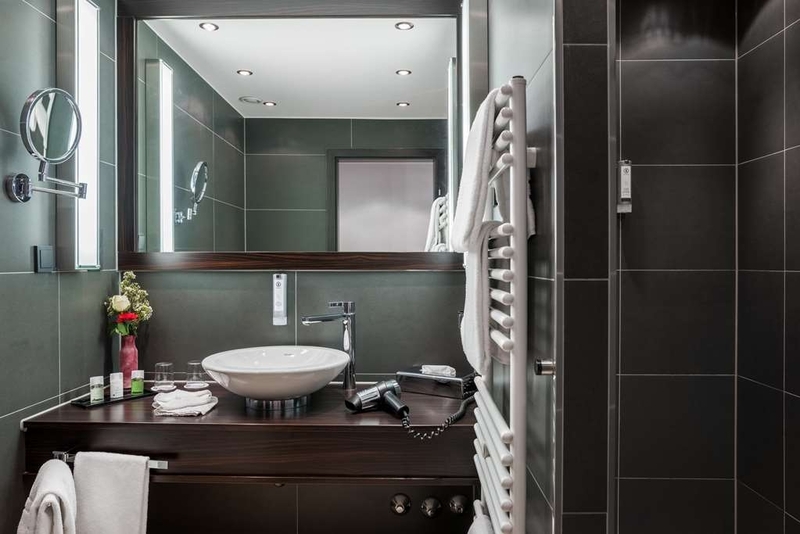 These rooms feature flat screen tv, mini bar, desk, walk-in shower, vessel sink, cosmetic mirror, hair dryer, warming rack for your towels, an assortment of pillows with different thickness. There are plenty of sockets to charge all your electric devises. The new air conditioning blows quietly clean and cold air. 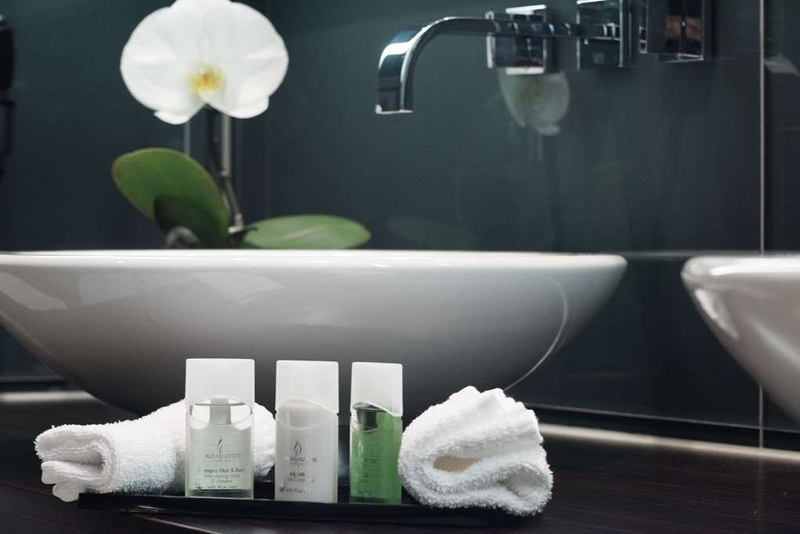 One of the reasons to come back are the friendly staff members who will do their upmost to make your stay comfortable. A special thanks to Mr. Buresch and Mr. Hübner as well as the entire staff. 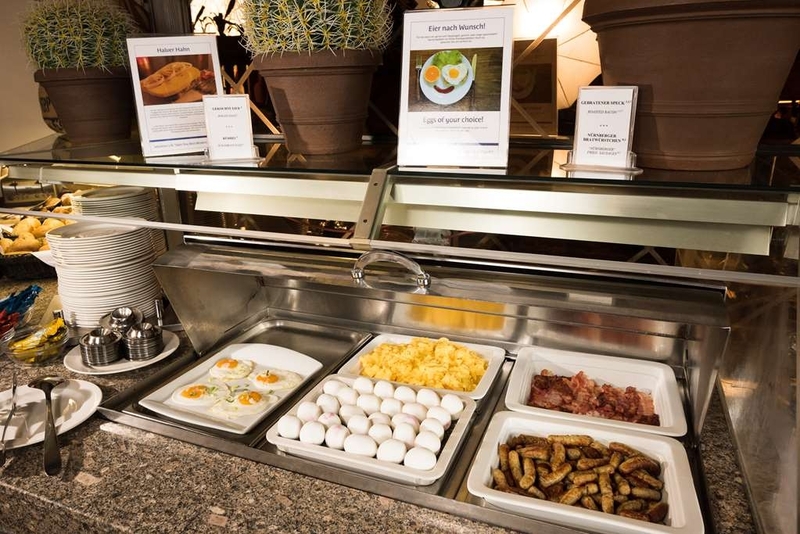 You also will love the delicious breakfast which is a mix between traditional German and international food. You can choose between several different coffees, teas, juices as well as water. 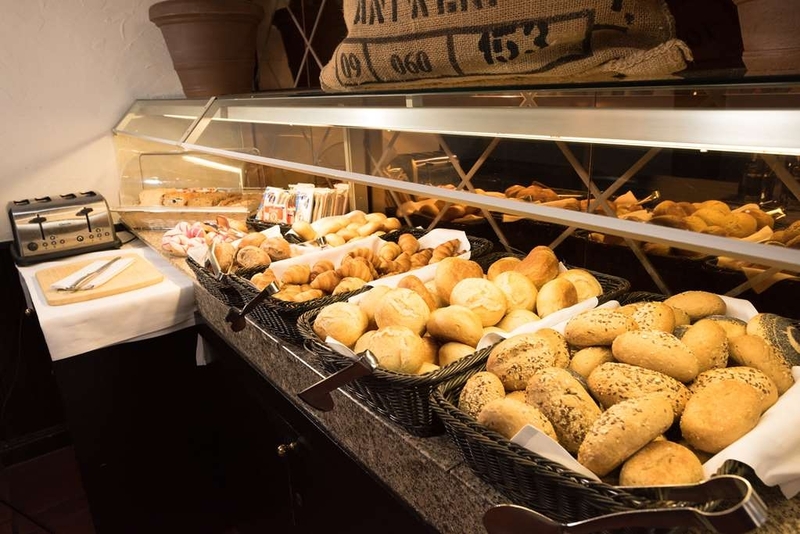 The hot and cold buffet offers next to German kaiser rolls, French croissants and American muffins. There is an assortment of German jam, honey, serials, fresh fruits, yoghurts and cold cuts (assortment of sausages, cheese, salmon and more). I'll be back - that's for sure. This is such a dirty hotel. Absolutely covered in stains on the carpet and wall. The stains on the wall can easily be cleaned there is no excuse for that. I stayed during a hot weekend and there is no air conditioning it was awful and stuffy. The standard rooms don't have a mini fridge and the only source of drinks is the vending machine in the lobby. Customer service was terrible, I stayed for 5 nights and had to request new sheets and made the bed myself. House keeping didn't even remove the litter in my room, I had to take my own rubbish out! Definitely not worth the price. Arrived late and leaved early in the morning, the only thing I remember of this hotel is that's old and mediocre for the price paid. Ugly shower, total absence of soap/shampoo in my bath. A careless hotel. Breakfast nothing more than just sufficient. 10€ for the parking. Forgettable without regrets. "Ok stay, do not expect luxury"
From a distance this hotel seems an outdated business hotel. Inside it is OK, but do not expect any luxury. The location is perfect for visiting the center, just cross the bridge. The hotel was fully booked, but understaffed, between Christmas and new year. Only one person at the reception, resulting in long waiting. We reserved for 2 adults + child, but the system only showed the adults. Since our room did not have a couch (turns into sleeping bed) and the hotel was fully booked we slept the first night separated in two different rooms. The inside pool has a nice size, depth and it the water temperature is delicious. Unfortunately nowhere is mentioned that you can get the towels for the pool/sauna at the (crowed) reception. Also, there is not a 'clean' area around the pool, where walking with shoes is forbidden, so flipflops are necessary. And in the elevators you can always smell the pool. Breakfast buffet quality is ok, although with full house they ran out of food and space. There were not enough tables, around the buffet too crowded, no coffee-cans for each table and refilling the food took too long. An obvious issue is that the waitresses have to walk through the buffet area with the dirty dishes to reach the kitchen, while it is already crowded. Our rooms are just ok, little bit outdated. Bathrooms clean and enough hot water. Unfortunately not a single dutch channel on the TV, while over 50% of the guests where Dutch. Wifi is good, because the router (and our room) was near the elevator. We accepted the 5th room. 4 other dirty toilet. Not make the bed old junkfood in the room. Not enough personel to clean the room. Not enough room during breakfast time. People do their best to make the best out of it. 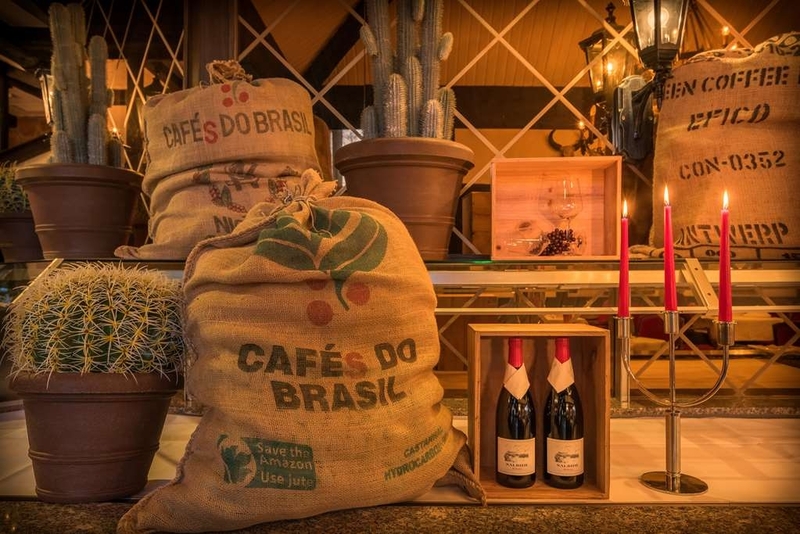 "Leoso Hotel Visit Could Not Have Been Better!!" Top shelf visit! Room was spacious and close to the Forum! Restaurant was THE BEST meal I had during my visit! Make the reservation, take the time, and treat yourself. So worth it! Attentive staff and teamwork at this hotel made it a pleasure to visit! Look forward to visiting again soon! 8-storey hotel 1990-style. Location Close to some autobahns. You go nowhere except a shopping mall with no decent restaurants which closes 8 pm. Then dead. Furniture and bathrom genuine 1990. No outlets for chargers. I my room they provided a lose outlet manifold so filthy I wouldn't touch it. 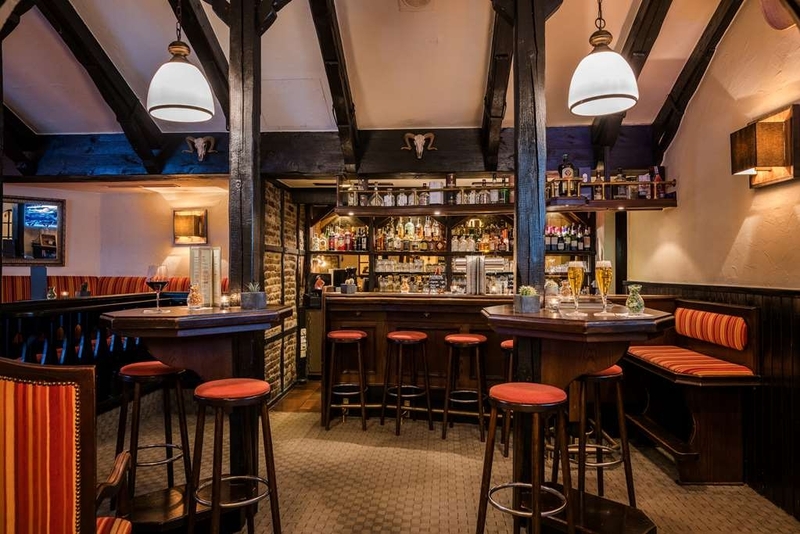 Restaurant and bar in-house. I paid 160 €/night which is overpriced. Breakfast 17€ which I generally think is overpriced. I did not test the quality though. "Accused to damage my room while she was dirty"
Very disappointed by this hotel. We spend a more or less stay: dirty room, no towel at the swimming pool, problem with the magnetic key for the room (4 times), reservation not recorded. Then, we were accused to do a red wine stain in the room which was there before our arrival. They blocked € 639 on our card without our permission. "good feeling in the whole hotel, good restaurant"
"Left in a time warp with poor service"
"personal were very helpful, nice swimmingpool"
Dear Guest, thank you for your Feedback. We´re happy that you enjoyed your stay with us. We hope to welcome you back soon. Best regards, your Best Western Leoso Hotel. Rooms are dated and public areas in need of a refresh. 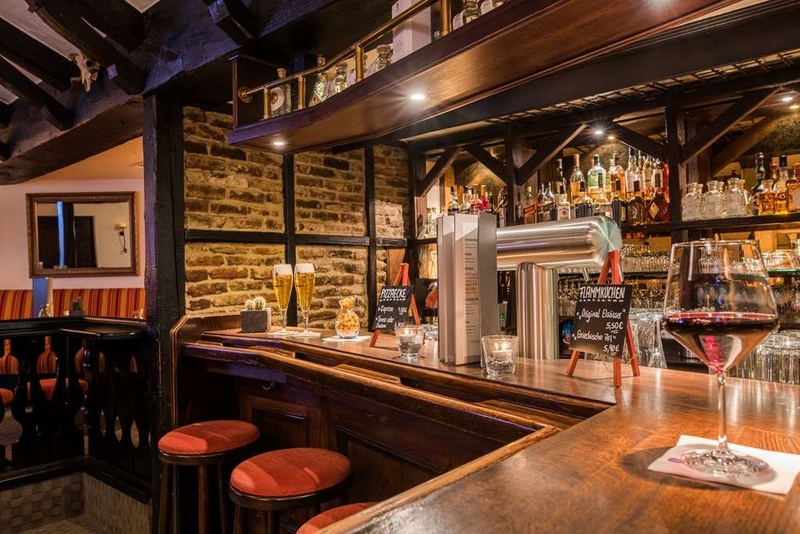 Tiny bar. Decent enough pool and sauna but nothing special. Breakfast not worth the 17 Euro! On the plus side staff very friendly and extremely helpful. "A very good Hotel in Leverkusen"
I stayed in this Hotel for five nights. I had previously stayed in this Hotel and was treated to the highest standards in terms of staff friendliness, etc. 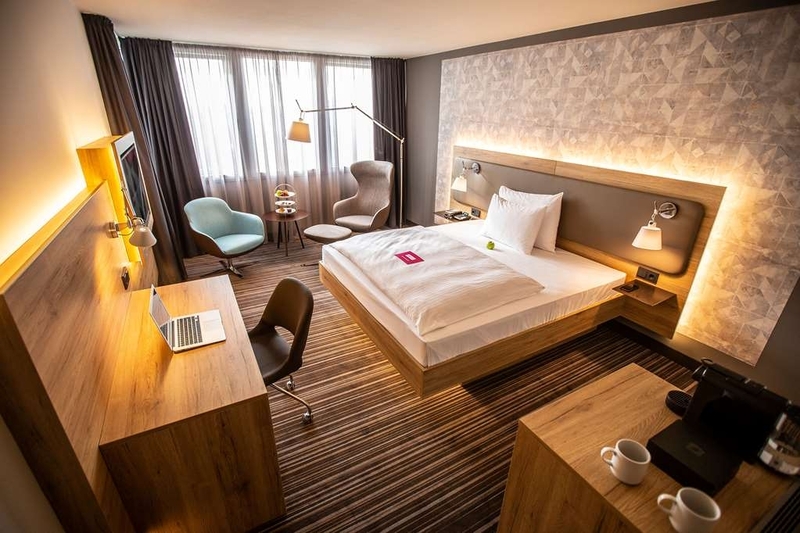 This time, the Hotel as you might expect in Germany is cleaned to the highest standard. 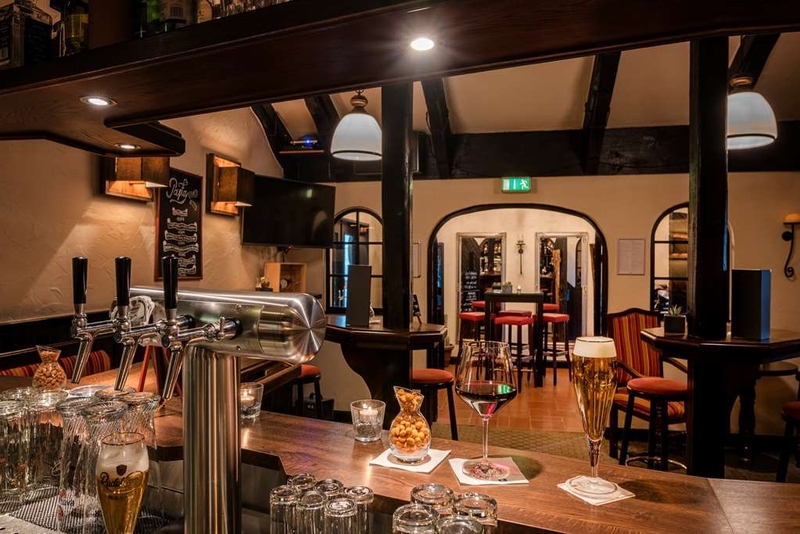 The bar area is very nice and there in nice selection of foods to eat on the menu. Try and large glass of german beer, very nice. During my stay there was a number of cameras around as a film was being made in the Hotel. I did have a problem regarding this and the unavailability of the bar one evening. I won't go into the specifics, but, many thanks to Sebastian at the reception for sorting out this issue. I remember the guy from my last stay, whose a typical person from Germany, incredibly hard working, helpful, polite and with excellent manners. This guy needs promotion. Leverkusen itself is a lovely area with many places to eat nearby. A fab Hotel with super staff, a lovely area of Germany and of course in one of the best countries in Europe. 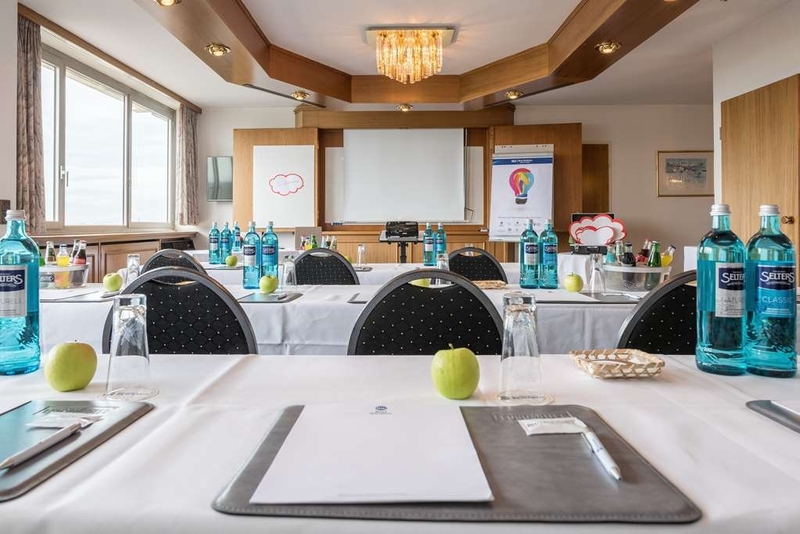 "well experienced and service oriented staff, especially housekeeping and staff in the bar"
More or least the best staff of hotel within business-trips within the last 6 months in Germany. I was really supported in technical questions als well as the description of shopping locations nearby. Very kindly everyone of the reception team. breakfast excellent and InternetAccess everywhere in the hotel also in swimming area. Dear Guest, thank you for your positive Feedback. We´re happy that you enjoyed your stays with us. Ans we hope to welcome your again soon. Best regards, your Best Western Leoso Team. 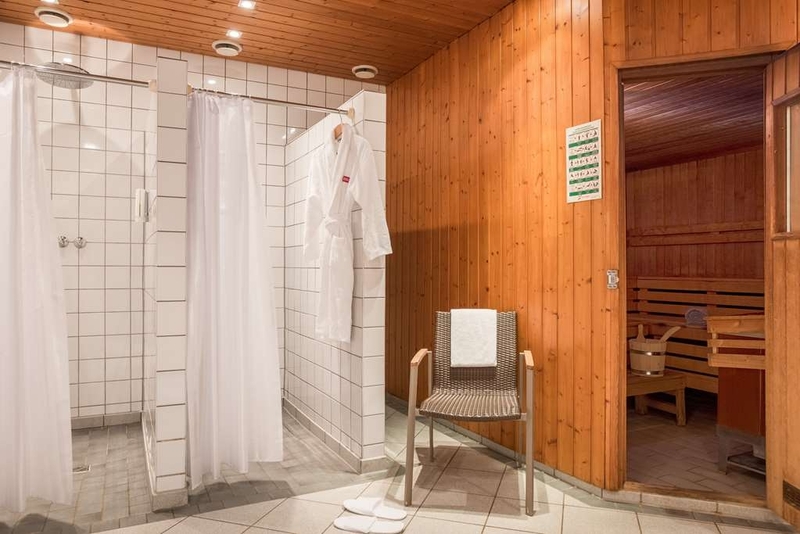 I enjoyed my stay based on the really service oriented staff and large rooms als well as nice relax-area beside the large swimmingpool area including sauna. The food in the restaurant was perfekt and not so expensive. The drinks were quite cheap in comparison to some other hotels. Dear Geust, thank you for your positive Feedback, and your compliment to our Staff. We hope to welcome you back soon. Best regards, your Best Western Leoso Team. "very good price level and extremely firendly staff"
the room size is very large. The location itself is very near to Cologne and also near to Düsseldorf. For me is this hotel the best possibility to visit my customers. I also like the pool-area especially the relax-area outside. The pool is ver large in comparison with other hotels. The most benefit for me is the extremely friendly staff in all devisions. Congratulation to the team-spirit! We took this hotel because it was close to Cologne, and indeed it is very convenient to move up to the motorway. The hotel is a bit old fashioned, but as could be expected from a German hotel, clean and decent. Free wifi is available. 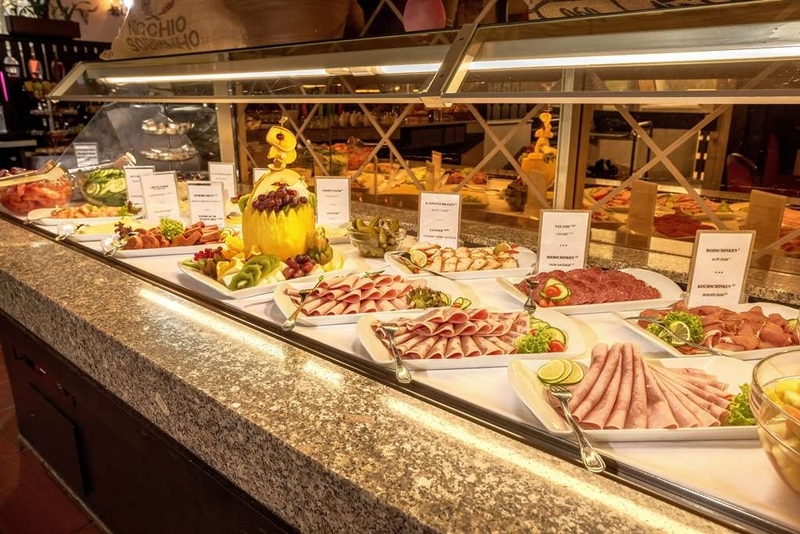 The breakfast buffet has lots of choice, perfect. In the neighborhood is a shopping area with a number of restaurants so plenty of choice there. I stayed at the Best Western for one night. The hotel is dated, and clearly needs a refresh. For one the carpet needs to be changed. The air conditioning was turned off when I arrived which made the room really hot. The lady at the reception was nice and changed my room upon my request. The rooms were clean and spacious though. The hotel restaurant was closed but there are some dining options within walking distance. All in all a pretty basic hotel. Dear Guest, thank you for your Feedback. We hope to welcome you back as our Guest. Best regards, your Best Western Leoso Team. Dear Guest, thank you for your Feedback. We would gladly have offered you an alternative room during your stay. I have forwarded your comments to the affected offices of our house, in order to examine the situation here and to fix possible shortcomings in the room as soon as possible. 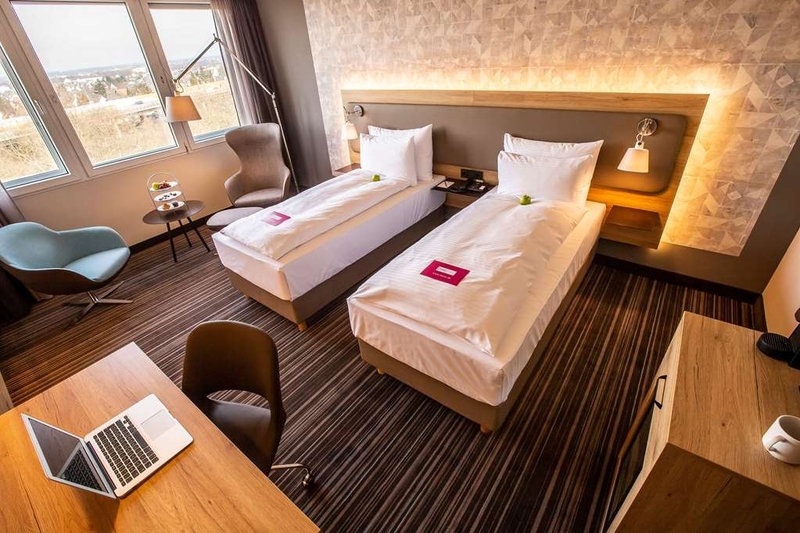 We are very sorry to hear that you were dissatisfied with your stay and would be delighted if you could give us the opportunity to be the host you wish for your next stay in Leverkusen. Best regards, your Best Western Leoso Team. "Had a very interesting visit, including a concert by Andre Rieu. Visited Cologne Cathedral and toured the city." We had a very comfortable stay. The room was large and very clean and there was a good choice of food from the buffet. Staff very friendly and helpful. Very central location for visiting Cologne. A large shopping centre nearby. Would recommend to anyone visiting the area. Dear Guest, thank you for your positive Feedback and your compliment to our Location and Staff. We hope to welcome you again as our Guest. Best regrads, your Best Western Leoso Hotel. Built in the suburbs of leverkusen, when you get in your room, you may think you are in the 70s. Quite old furnitures, beds, bathroom, but a large flat TV( quite new). Mattress was so uncomfortable I didn't sleep all night. On the other hand, personnel was kind with us. I have read a few poor reviews about this Hotel. Well, I must of stayed at a different Hotel. These people are wrong. 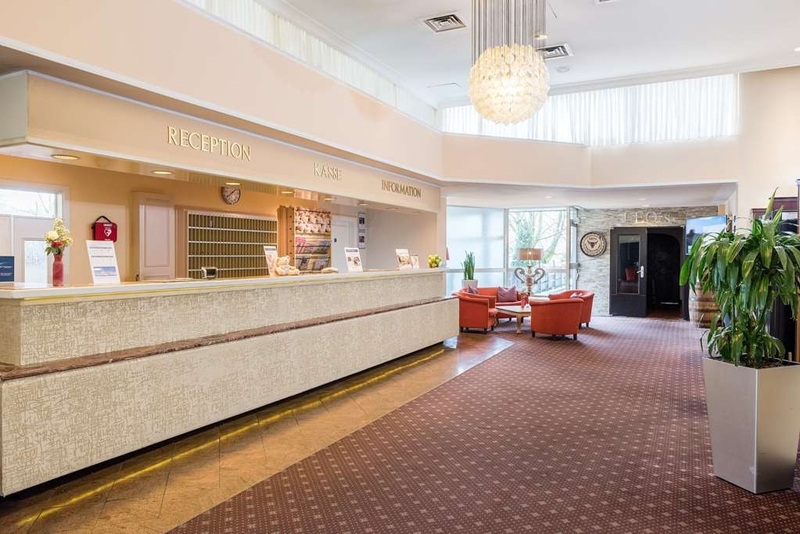 The Hotel is in a beautiful part of Germany, the relaxing quiet area of Leverkusen, with nice shops, places to eat and excellent public transport. The Hotel is spacious and very clean. The breakfast is unreal with a buffet of hot and cold food. The Hotel had a kids Football team staying at the time. I thought it would be noisy. It was completely the opposite and very quiet. The staff are very polite, very friendly and very helpful. I will come back to this Hotel. "Old style for high price"
Room is spacious but it used to be a smoking room as it smells like tobacco. The furniture old, the chair next to the table was broken. It says the bed is a double bed, I would say if it is necessary, but pretty small. There is an offer when the minibar is included which is nice. Hotel facilities quite old but functional. The pool is nice, and not crowded which is true for the sauna as well. The best part is the breakfast, it is typical german. The variety is huge, and you can have several types of coffee (freshly ground) from the coffee machine. The hotel location is pretty good, a big shopping mall is near by. Lots of places to eat. Staff should be more kind and helpful. I had some difficulties with the payment, than they wont able to give me the correct invoice, and the lady at the reception was pretty offensive. I would expect more kindness if Im staying there for two weeks and spending a lot of money. Dear guest, Thank you for your feedback. We appreciate your compliment to our location the breakfast and the pool and sauna area. We are pleased to inform you that the renovation has been decided by the management in the past weeks and a sample room has already been commissioned. These renovations will be very short term. We would be delighted to welcome you again. Best regards, Your Best Western Leoso Team. Dear Guest, thank you for your positive Feedback. We are glad that you enjoyed the stay with us and we hope to wellcome your back in our Hotel. Best regrads, Daniela Miebach, Supervisor Front Office. 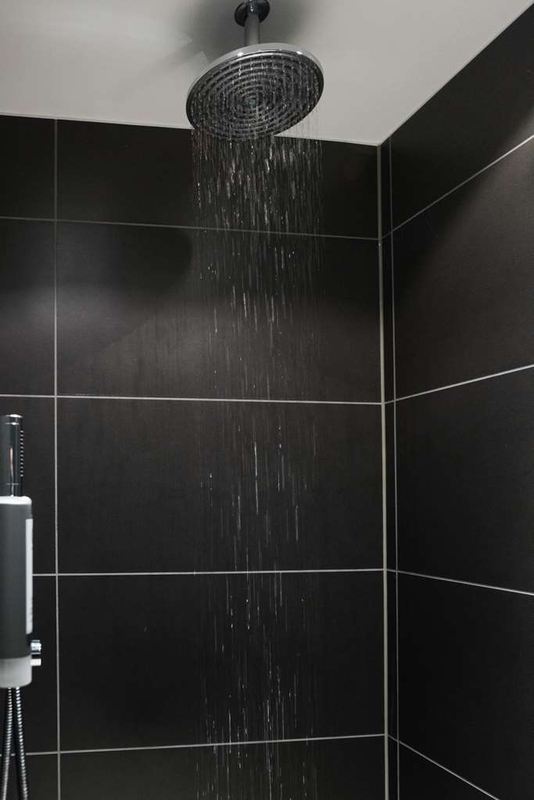 "Poorly maintained & no hot water !" The staff were nice but the hotel is very run down and needs to be refurbished. My room smelled of cigar smoke and there was no hot water available in the morning ! They tried to say that I was the only one complaining but the entire hotel was affected as there was a queue of people at reception complaining about it. No apology from management either. "The retro-feeling that is unwanted..."
Dear Guest, thank you for your constucktive Feedback. I have forwarded your comments to the affected offices of our house, in order to examine the situation here and to fix possible shortcomings in the room as soon as possible. 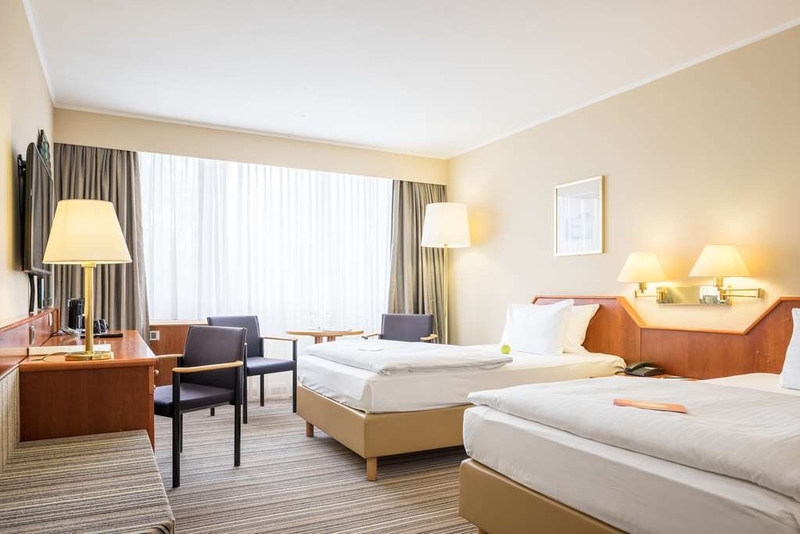 We are very sorry to hear that you were dissatisfied with your stay and would be delighted if you could give us the opportunity to be the host you wish for your next stay in Leverkusen. Best regrads, Daniela Miebach, Supervisor Front Office. ... and definitely not the room at the from their pictures. I stayed here during a business trip for about a week. For sure this hotel had seen better days. The room was kind of ugly. The carpet, the curtains, the armchair had several big stains... The windows even some mold. It smelled everywhere musty so I did not even tried the pool. The breakfast was OK but average. Stuff average as well. After brushing I always put the lose hair into the rubbish bin in the bathroom. Imagine how surprised I was to find them and a band-aid I had used in the toilet... but not even flushed. That's how the cleaning staff gets rid of their dirt...Would not wonder if the pipes will be blocked soon..
"Stay away from this Hotel if you can!" Standards in German hotels tend to be quite low so we usually go for a brand name just to be safe and adjust are expectations. We still managed to be shocked by this hotel! The furniture and décor are dated, not really problem for us but one of the chairs was so wobbly that we were scared to use it. The bathroom had no source of heat and an extractor that did not work. The shower curtain was stained. The room was large but freezing cold, the frames of old aluminium double glazing widows were moldy. The glass did nothing to cancel the noise from the busy road beside the hotel. The only source of heat was a small plug in electric fan heater. Even with that we had to close the curtains to get the room warm! Sometimes a bad thing can be overlooked if other things are really good. This is not the case. In our room it seemed as though one bedside table had been removed (perhaps it fell apart! ), the towels were OK but nothing great and no nice products in the bathroom. There was tea and coffee but no kettle and no spoon or stirrer either. Perhaps other rooms are better, but at 110 euro for the room (including breakfast), plus 12 euro per day for parking, this standard was not even good value. The staff were nice and the breakfast good. However, when we left the do not disturb sign out until 1pm one day and then left the room, no cleaning took place at all. We mentioned this at the reception at 6pm and the response was just an offer of clean towels. It was no wonder that no one asked us how are stay was at checkout! I think standards in most German youth hostels are much better than this. Dear Guest, Thank you for your feedback. We would gladly have offered you an alternative room during your stay. I have forwarded your comments to the affected offices of our house, in order to examine the situation here and to remedy possible shortcomings in the room as soon as possible. 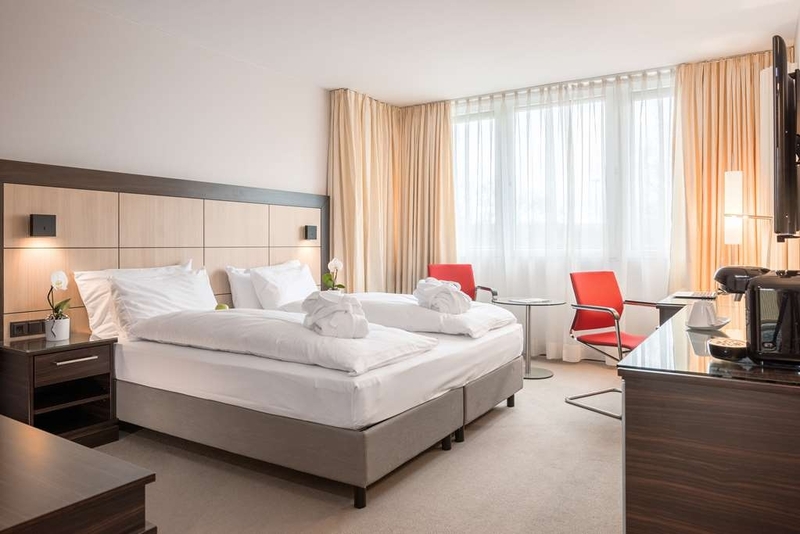 We are very sorry to hear that you were dissatisfied with your stay and would be very pleased if you could give us the opportunity to be the host you are looking for during your next stay in Leverkusen. Best regards, Daniela Miebach, Front Office Supervisor. 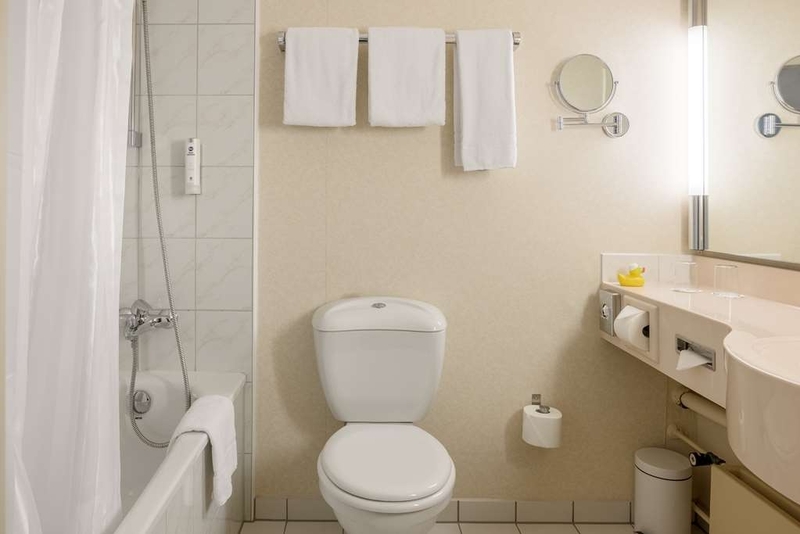 As most German hotels, this is a clean hotel. But it is not very quite because it is by the highway, and the parking still cost you 12euros unlike the USA same hotel always free. The breakfast is ok (as all German hotel offers good breakfast) but not as good as others. It has pool underground if you like to swim and it has a steak restaurant for nightly dinner as well. However my room has a bathtub that I do enjoy after sightseeing all day. Dear Guest, thank you for your Feedback. We usually reap a lot of praise for our particularly central location, as the surrounding metropolitan areas, etc., can be reached in the shortest possible time. The parking fees charged by us in the amount of 12 € per day correspond to less than 50% of our local competition. Since the parking lot is not operated by us, the fees are transferred as a continuous item to the landowner. We ask for your understanding that we have to pass these costs on to our guests. We hope to welcome you again. Best regrads, Daniela Miebach, Front Office Supervisor. Clean and spacious room, easy WiFi access and includes a wonderful breakfast selection. The restaurant is also first rate. I have to agree with other guests that the room was too warm. Unable to open window and turning dial to "cool" did not change the temperature. Dear Guest, thank you for your positive Feedback and your compliment to our Breakfast and restaurant. We hope to welcome you again. Best regrads, Daniela Miebach, Front Office Supervisor. "Old and tired - but good food and service"
The rooms are spacious and fairly clean, but very very dated, scruffy and hot, with no temperature control (broken a/c) or even a fan; I had to sleep with the window open - over a very noisy road. Dread to imagine what this would be like in high summer. On the other hand, service is friendly, good wifi, surprisingly excellent steaks in the restaurant. 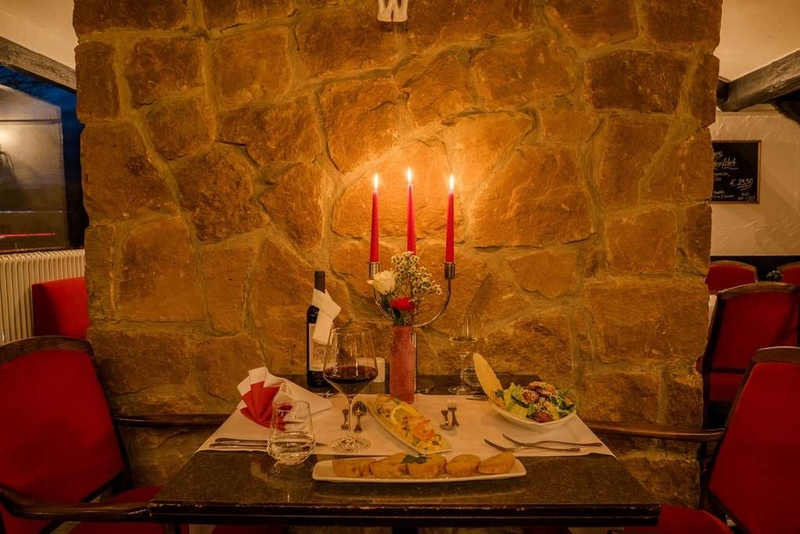 Dear guest, thank you for your compliment to our service and the restaurant. Our Deluxe category was redeveloped until the end of 2013 completely, further modernization will follow successively. We would appreciate if you would give us a next stay in Leverkusen the opportunity to be the host, you desire. Best regrads, Daniela Miebach, Front Office Supervisor. 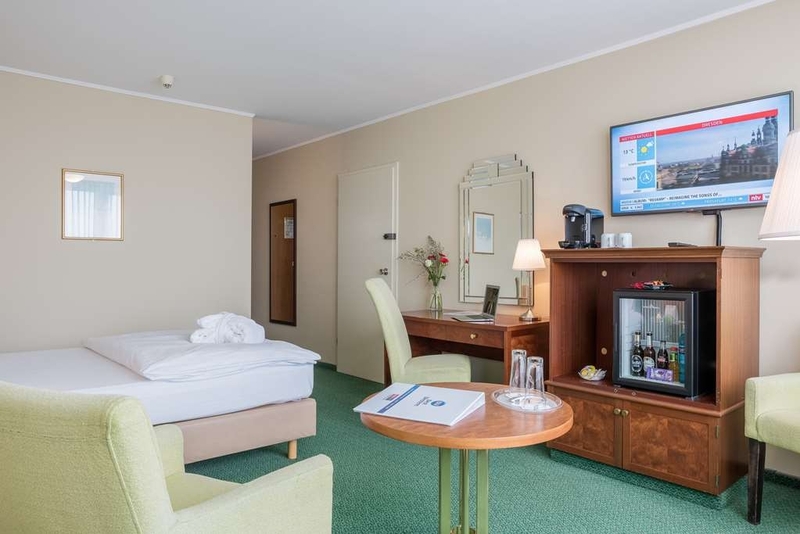 "good place to stay in leverkusen"
I have been travelling to Leverkusen for over 30 years and have mainly stayed at this hotel. It is comfortable, has a pool and a good restaurant. The hotel is easy to find and has a good car park.For business or leisure it is a good choice. Visit was overnight stop on way back from Austria by coach. Understand room was a basic one but décor was scruffy and dated. Two of the five lights in the room were not working and the bins had not been emptied and were full of beer bottles. Did not go down and complain as we were very tired and just wanted to sleep. Breakfast early next morning was one of the best continentals I have tasted. Pity room did not match up to this standard. Filled in online report form on return to UK and received immediate apology. Full marks to hotel for that. Dear guest, Thank you for your feedback and your compliment to our breakfast. We would have you offered an alternative room for your stay. We hope you return to welcoming you. Best regrads, Daniela Miebach, Front Office Supervisor. Spent two nights here over the weekend. The five of us had 10 different roo. 's in which NONE of the air conditioners worked. Sorry but management's consistent excuses in response to TripAdvisor reviewer comments are just words. The staff was clear none of the AC (or heat) works so just tough it out. I would have given one star if not for the amazing bar/restaurant attached to this aged hotel. The steaks are wonderful and the staff energetic at great service. If you choose to stay make sure not during weather extremes. And if you don't consider it a place for a great meal. Dear Guest, thank you for your feedback and your compliment to our restaurant and bar. Our Deluxe category was redeveloped until the end of 2013 completely, further modernization will follow successively.We are very sorry that you were dissatisfied with your stay and would be very pleased if you get an incoming stay in Leverkusen the opportunity to give to be the host, you desire us. Best regrads, Daniela Miebach, Front Office Supervisor. "Quality hotel, Friendly employees, close to everything." On a short trip I stayed again in the Best Western Hotel in Leverkusen, Germany. I keep coming back to this place since six years. 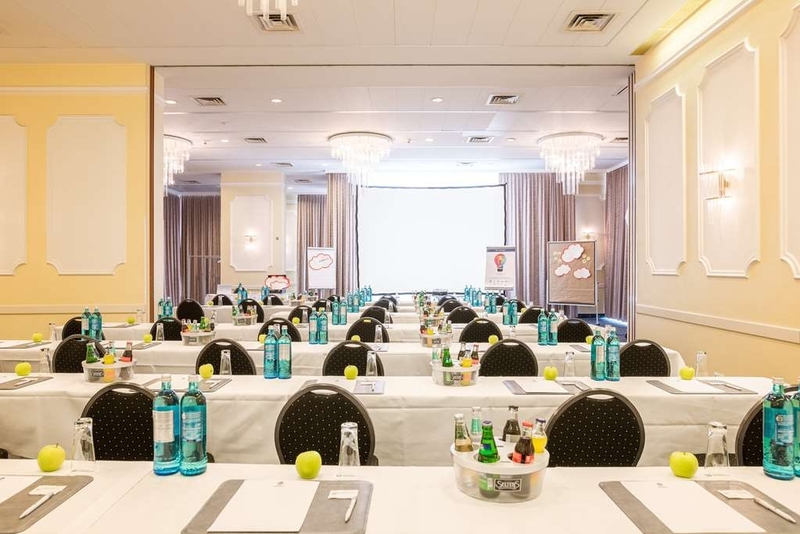 The location is conveniently close to Cologne but also not too far to Duesseldorf. The hotel has different room categories to choose from. I was thrilled to stay in a business suite on my recent stay. These are the biggest sized rooms this hotel has to offer. Those rooms feel more like a vacation condo/apartment. There is a living room with table and four chairs to accommodate guests for a business meeting. 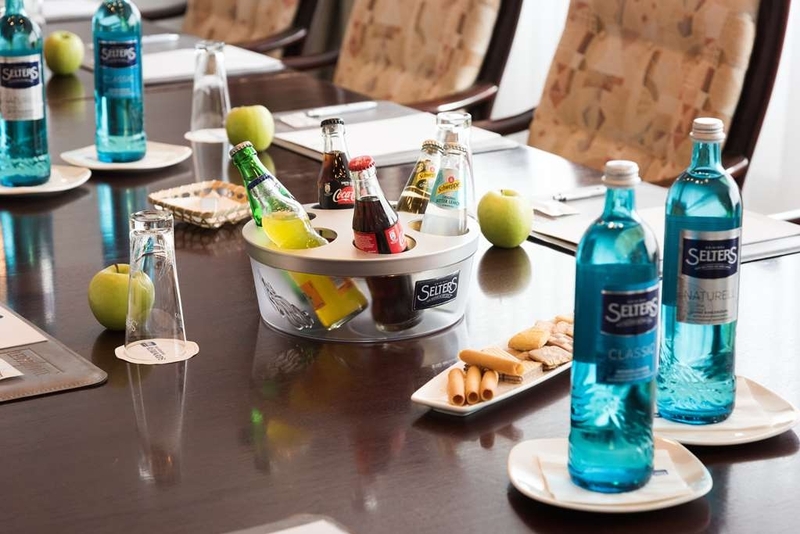 Here you can host professionally for a small business meeting with a well-stocked fridge and coffee maker. These suites are also providing a cozy TV corner with sofa to sit three. There is flat screen TV, a desk, plenty of outlets (220 volt) if needed. Access the bedroom from a little hallway which also leads to the bathroom and a separate toilet. The bedroom features a master bed with a good mattress and cozy pillows, dresser and cabinet as well as a flat-screen TV. 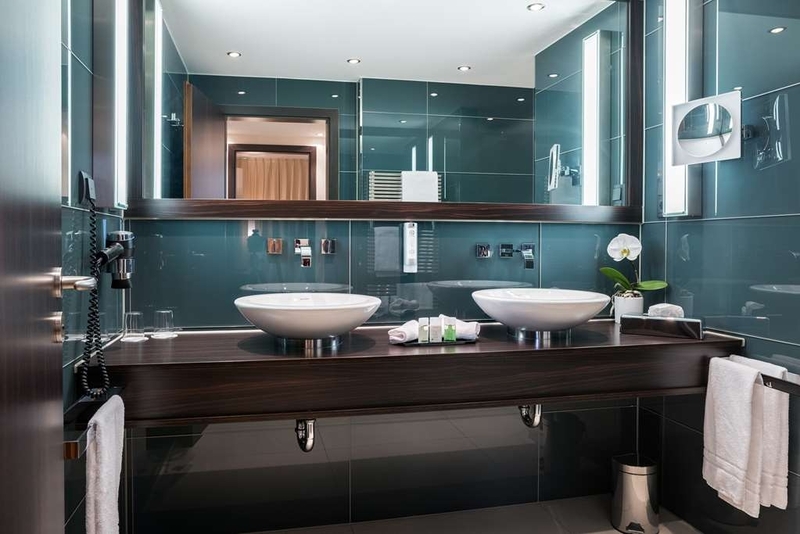 The spacious bathroom is absolutely stunning with its walk-in shower and raindance overhead shower and double vanity with nice vessel sinks and modern faucets. 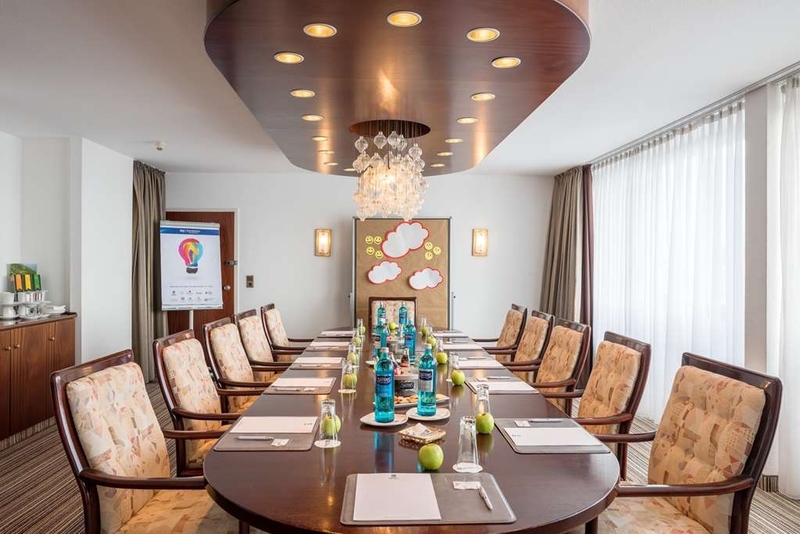 The business rooms are equipped with central A/C which has a thermostat and blows cold air very quietly. WIFI works fine and is included in the rate. Breakfast is complimentary and starts at 6.30 until 10.30. A good variety of breakfast items are being offered. I love the coffee, kaiser rolls and fresh fruits. Every time I feel welcome here and I can highly recommend to stay here. Dear guest Thank you for your very positive review. We are pleased to welcome you again with us. Best regards, Daniela Miebach, Front Office Supervisor. "Good breakfast and an okay room"
Dear guest, Thank you for your feedback. Our Deluxe category was redeveloped until the end of 2013 completely, further modernization follow sukzessive.Wir hope to welcome you back with us. Best regards, Daniela Miebach, Front Office Supervisor. Stayed one night on business, hotel staff excellent and friendly. Great size room, nice and clean with a great view of the football stadium, with free minibar and complimentary drink at the bar, which was a nice gesture. 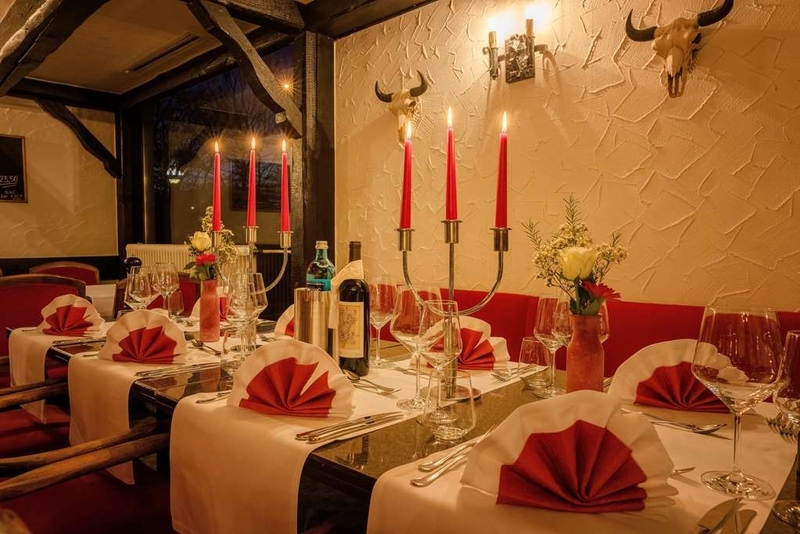 Restaurant food was excellent and we had the best steak while in Germany, cooked to perfection washed down with a great recommended wine. I would highly reccomend this hotel. Dear Guest, thank you for your positive feedback and your compliment to our Rooms , Bar and Restaurant. We hope to welome you back as our Guest. Best regrads, Daniela Miebach, Front Office Supervisor. Dear Guest, thank you for your feedback, and many thanks for the compliments for the location and breakfast. I Have forwarded you comments to the affcted areas of our hotel to check the facrs as quickly as possible to eliminate any deficiencies. We hope to welcome you back as our Guest. Best regrads, Daniela Miebach, Front Office Supervisor. "Fine for a stop over hotel "
It's a Best Western ... My heart sank when he said those words ... It never bodes well! And I was right. The reception area is nicely decorated - only one lift and god knows how many people checking in together so we used the stairs - concrete - no decoration. Room 217 ... One window is broken and it felt like a sauna. Call to reception resulted in nice German gentleman coming to the room and saying he couldn't fix it! Then turned up 20 minutes later with some tools and hey presto - fixed window. Very basic, comfy beds, run down and in desperate need of a refurb. Shower water was freezing but I suppose that was a plus point in a room which was too hot! Also quite noisy. Windows were opened once fixed but right next to a very busy road so if traffic effects your sleeping - you have no chance. On the way back we had a different room and once again only one window opened. We did however learn there was air conditioning in the room so I don't know why the reception man didn't tell us that last time. However all in all for a stop over hotel it is fine and looks to have a very good steakhouse attached which I unfortunately didn't get a chance to try. Dear Guest, Thank you for your constructive feedback. I have forwarded your comments to the affected areas of our house to check here the facts as quickly as possible to correct any deficiencies in the room. 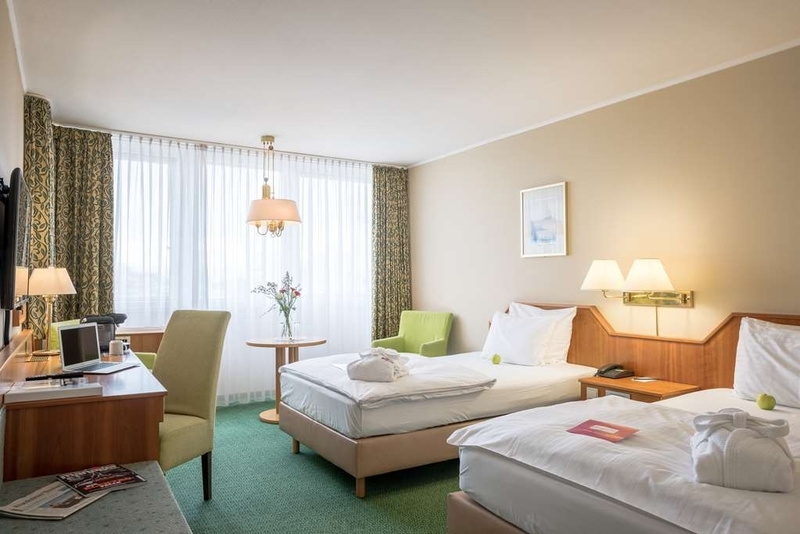 We are very sorry that you were dissatisfied with your stay and would be very pleased if you get an incoming stay in Leverkusen the opportunity to give to be the host, you desire us. Best regrads, Daniela Miebach, Front Office Supervisor. Yes the rooms could do with a spruce, but who cares. The staff who cannot do enough for you are outstanding. I have problems with feathers, the duvet & pillow were feathers. I went to reception to tell them, not a problem changed within 10 mins. The food is fab, and breakfast if you cannot find anything to suit your very hard to please. Breakfast is amazing. All of the staff are very welcoming and pleasant. Very close to shops, their hotel bar I wouldn't say was over expnesive €5 for a large beer, it could have been worse. Our first time in Germany and we will be visiting again. Would I recommend this hotel, definitely. Clean, welcoming, lovely staff amazing food. Cannot ask for more. Great hotel a bit dated but would stop there again. It coped with 80+ of us very well. Helpful staff. Very handy for the shopping centre. The food was at a very high quality. 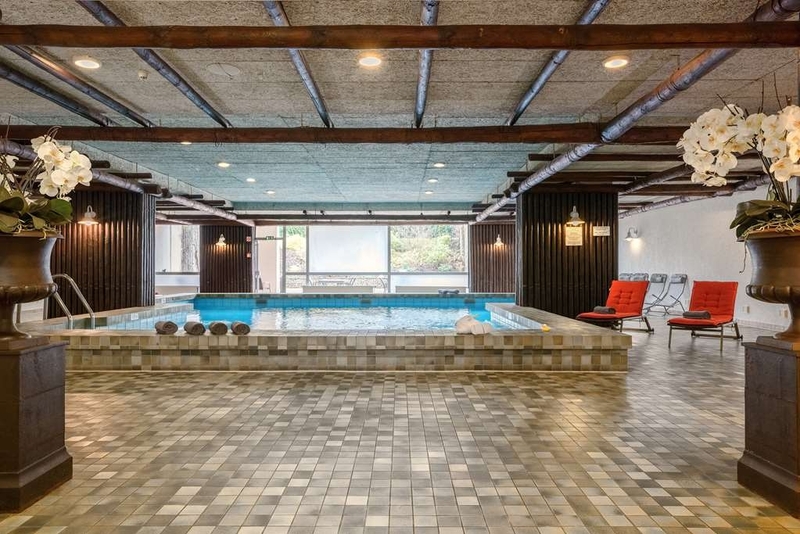 It was great to have the use of a swimming pool and sauna. So if your on a visit to Germany it would be a good place to stay. Dear Guest, Thank you for your compliment to our staff, pool & sauna area and restaurant. We hope to welcome you back with us. Best regrads, Daniela Miebach, Front Office Supervisor. Dear Guest, thank you for your postiv Feedback and your comliment to our Steakhouse and Breakfast. We hope to wellcome you back in our hotel. Best regards, Daniela Miebach, Front Office Supervisor. "Noisy location and mix up over evening meal." Stayed here for 3 nights on a National Holidays trip to see Andre Rieu at Maastricht. After travelling for almost 17 hours we arrived at the hotel expecting an included 3 course meal. Our coach drivers had phoned ahead and confirmed the time we would be arriving, just before 10 p.m. and that the meal would be ready. On arrival we were told they couldn't find the booking for the meal and that as the kitchen closed at 10 p.m. they could not even prepare any food at all for us. Not a happy coach load of weary travellers! Very few of use found anywhere else to eat and not an area we felt comfortable about walking in late on a friday evening. We were later reimbursed 10 euros each by our coach drivers but only on production of food or drink receipts. Not very disabled friendly with steps up to the entrance, tiny lifts so took a long time to get everyone up to their rooms. It was a hot night and with no air conditioning we opened the bedroom window only to find we overlooked a mainline rail line with trains running every few minutes all night, sounded as if they were coming through the room! Hardly slept for the 3 nights. The room was a generous size and the beds were quite comfy apart from very thin pillows, some bedding was also heavily stained but was changed often during our short stay. En suite Bathroom was also a generous size. Breakfast buffet was excellent as previous reviewers had mentioned, couldn't fault it. Complimentary tea and coffee in the reception area was only available in the morning up to about 11 a.m. but was then whisked away. On querying this were told to use the coffee maker in the room, had to ask for milk and tea bags as supplies were not replenished. Overall would not want to spend more than one night here. 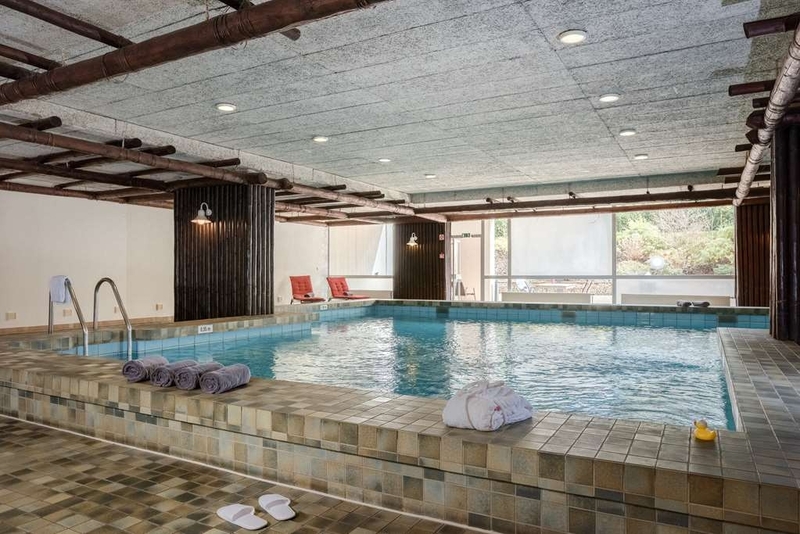 "Good hotel, friendly staff, great restaurant"
The hotel has a nice pool on the basement level. 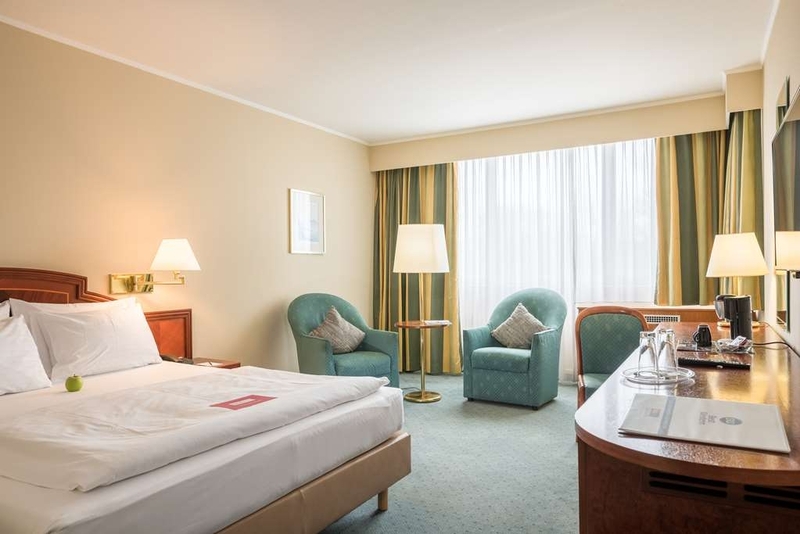 It is in a handy location, Leverkusen main town and shopping centre is only a short walk from the hotel. There is a pleasant walk along the river behind the hotel. Free Wi-Fi and breakfast. Dear Guest, thank you for your positive Feedback. We hope to welcome you back with us. Best regards, Daniela Miebach, Front Office Supervisor. "Normal hotel for business trip"
Dear Guest, thank you for your compliment for the location an breakfast. And Thank you for your constructive notice, we would have the possibility to offer you a alternative room. With best regards, Daniela Miebach, Front Office Supervisor. "Nice staff, but run down & questionable location"
This hotel was a stop for our group for one night. We had a nice buffet dinner & breakfast with this hotel that accommodated all types of appetites. The entire staff was friendly, efficient, and very helpful. During the course of the evening, the police were called for a fight that took place right outside of the hotel's lobby glass windows. I know this was outside of the hotel; however, it made us question the safety of the area around us. The rooms were fairly clean, but very run down - dingy & peeling, coupled with an air conditioning unit that did not cool and was in need of maintenance. The hotel is in need of major updates for safety (door locks) & comfort. I`ve been staying here for a one night with a group of football fans from Ukraine in June, 2016. 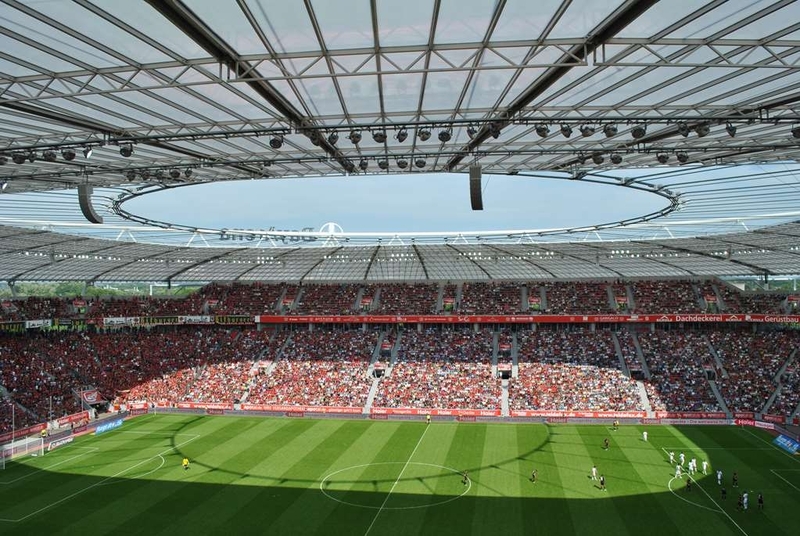 The hotel is situated not far from the stadium "BayArena". So, I'm not sure that on the days of mattches it's quiet. The twin-room was not large, but acceptable for 2 people. As for me, the equipment is quite old. No refrigerator in the room. The bathroom needs a renovation. Polite service. Free Wi-Fi. 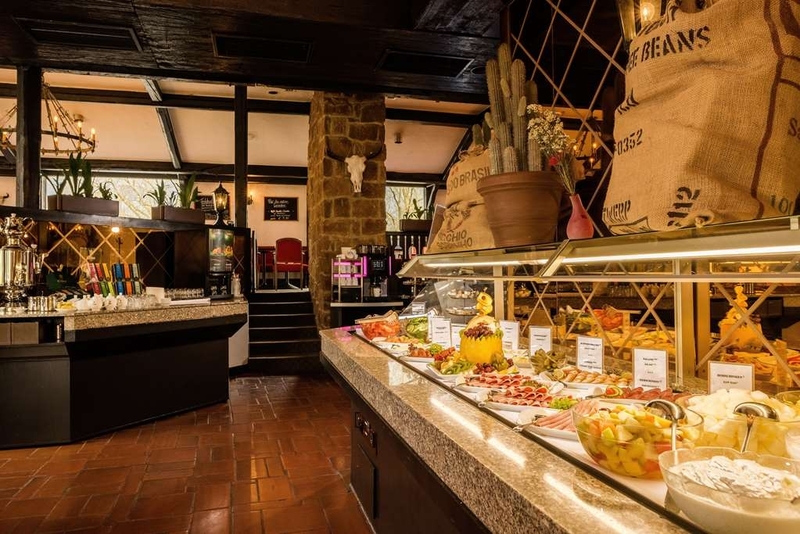 The breakfast was general for such hotels in Europe. I stayed in Leoso Best Western for almost 2 weeks on a business trip. For sure I can say that I would stay there again the next time I'm visiting Leverkusen. The room was with a bit old furniture but it was clean and tidy. The room was cleaned daily. There was a minibar and it was included in the price. Also there was a flat screen big TV in the room so I experienced no problem watching the EURO 2016 games. There was a bathtub in the bathroom and a hairdryer. The breakfast was nice and delicious. There is choice what to eat. The people on the reception were nice and polite. They spoke good English and was no problem to communicate with them. They offer a lot attention there as reading glasses, sponge to clean your car window, umbrella for the day and etc. You also can leave there you luggage on store for free in the day of your check out. The hotel has a charger for electric cars. This is the second time I stay with my family (wife and daughter of 5) in this hotel. 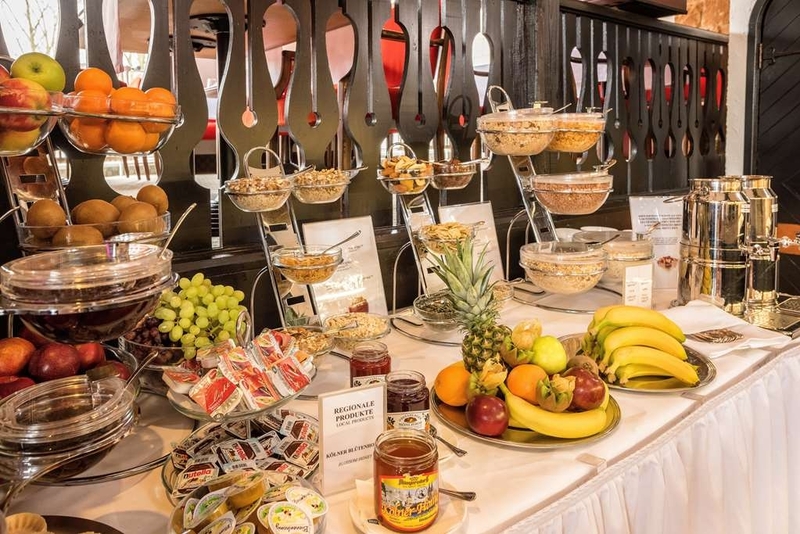 The room charge may seem initially higher than others but when you take into account the location, the service (like wifi) and the breakfast (all you can eat), then it is worth the price. Personnel were very friendly and we had a good night sleep. This is a good hotel with all basic facilities. The staff at reception was a mixture of good and bad. Jan at the reception is a five star material and would go very far in the hospitality industry. His two lady colleagues in the afternoon shift were the opposite of hospitality, almost hostile in response to any query. Staff at the bar and restaurant and bar were exceptionally pleasant and charming. Very hard working and competent. Hotel is at a distance from koeln messee but close proximity to train station was very convenient. Stairs leading to the hotel make it cumbersome for a traveller with heavy baggage. The hotel must address this problem. My room was not provided with a tea coffee maker which is very surprising but the room service gave free tea coffe on demand . "Business hotel with good service but aged interior and equipment"
The Best Western is a typical Business Hotel. Location is good connected to train and highways. City is in walking distance. Negative is the total sound level since it is in proximity of the highways you can not open the windows (which are double glassed anyhow to limit the noise exposure). Service at the front desk was exceptionally friendly and good. Breakfast is good. A pretty negative aspect is the old and over-aged interior and equipment. You easily see, feel and smell that the equipment is old and pretty much used up. The heating/air condition device was not controllable and heated the room too much. However: if asked if I would stay again for my nextr Business trip I say a clear yes due to the service and the proximity to the city. Stayed here on the 13th and 14th, and it was dire. Bad parts bedding under the duvet was filthy and yellow, no drinks, water, tea or coffee, heating doesn't work, windows have a gale blowing through them, bathroom was tired and dirty and I could not sleep due to lack of sound proofing and the nearby trains. Good bits breakfast was okay and reception were friendly. My advice goto the Ibis or stay in Cologne. Even the locals say stay elsewhere. 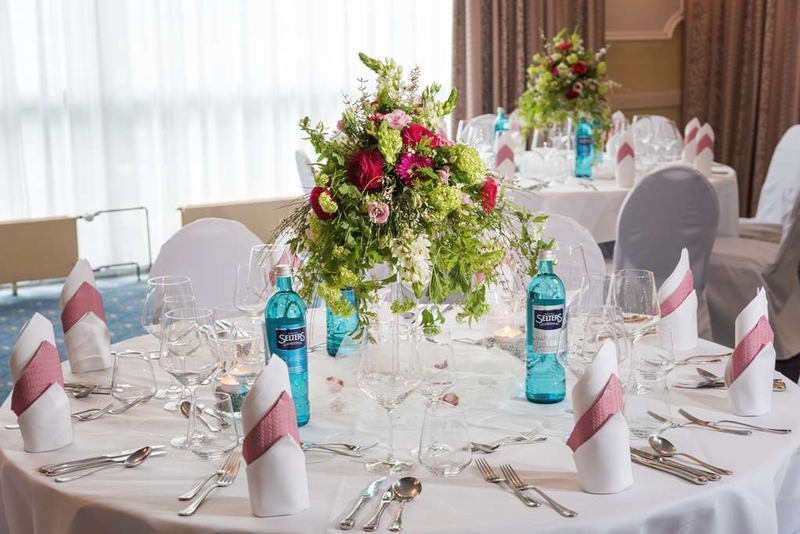 "A Christmas surprise at the Best Western Leoso Leverkusen"
The location of this hotel is very convenient because it is close to major German cities. We were visiting Cologne and stayed at this hotel. I paid 100 Euros one night and it included parking fee and buffet breakfast for 2 adults and a child. Room was clean and comfortable. Modern hotel with larger than average rooms. 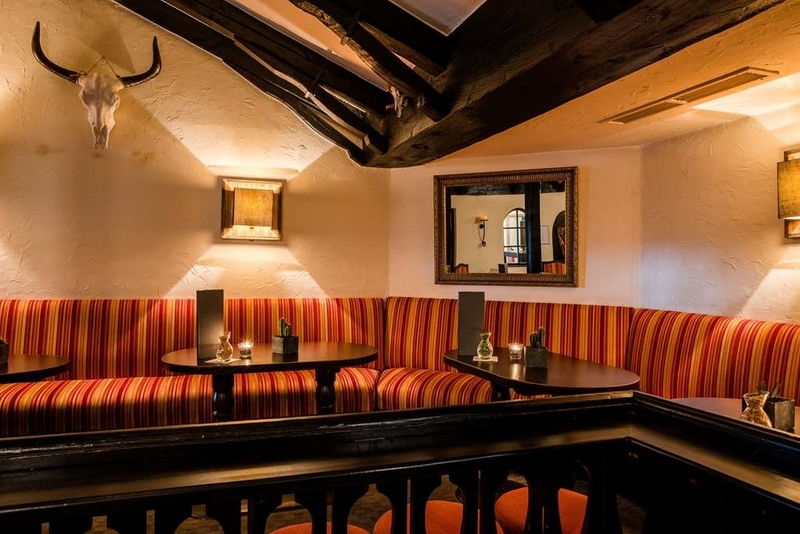 Everything clean and well organised, very good breakfast, nice cosy bar. Convenient for trains into Cologne and the Rathaus shopping centre which is just across the road has a great choice of shops and cafes with a pretty good Christmas market (at Christmas time). "Poor quality, not close to four star"
We stayed here for one night as we visited the game between Leverkusen and Barcelona. Reception services very poor e.g. we found that our room just had half a curtain to darken the room. Before going to the match we asked if this could be fixed. They promised to look into this. When we came back nothing happened. Bear in mind that bright lights were shining through our window because lampposts were illuminating the parking space. When we went to the reception to complain the receptionist said that "no room had curtains".... Didn't see that coming! She also said she couldn't fix it because she was alone. Still we asked for another room. This wasn't possible as the hotel was full. We decided to make the best of it and try to get the children to sleep. As they were in bed after 20 mins the receptionist called that they - all of a sudden - had received a cancellation. We didn't took that offer as it would be to much of a hazzle (eg. getting the kids out of bed) to change rooms. Checking out the next morning the new receptionist didn't make any comments on our complaints. Very, very disappointing. To meet the four star rating requirements investments need to made in refurnisments/repairments and training staff. We were travelling to Cologne to the xmas markets and stayed here two nights the hotel room and bar were pretty good but the food was very average. 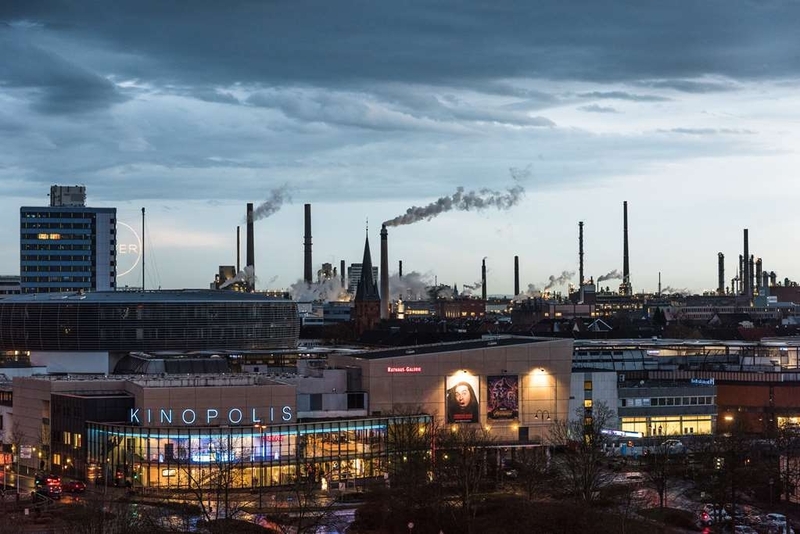 There was a cinema right across the road and quite a big shopping mall. It was clean and in quite a good area. This hotel has been one of the worst of my life. At first, the elevator was not operational, so we had to go up 6 floors, with heavy bags. After that, when I was going to sleep, I open my bed and was unclean. I ask for a new room, but was full, so they gave me new sheets. When I was changing the sheets, I found a cockroach on the bed. Absolutely disgusting. Stayed here as part of Christmas Market holiday. Great hotel in a great location. Lovely staff, rooms were a bit dated but clean. Had breakfast and evening meal at hotel. Evening meal was really nice, breakfast was a good choice of continental type breakfast or scrambled eggs, sausage and bacon which was served cold on both days. My only gripe about the hotel is the cold scrambled eggs and bacon. I would have no hesitation in staying here again. There is a fantastic shopping centre across the road from the hotel which also has a christmas market which is cheaper than the ones in Cologne. We prefered the christmas market in Leverkausen. Cologne has seven christmas markets which all sell identical items quite dissappointed in these markets although the atmosphere is good. We have stayed at this hotel a few times before and especially enjoyed the great breakfast buffet! This time everything seemed to be wrong- the elevators were not working, the breakfast room was overcrowded with tourist groups and a large contingent of the police. The first room was a smoking room, the replacement room had an older bathroom with a shower curtain way to long and mold starting in the corners of the ceiling. In general, I was disappointed. The breakfast buffet was the only good part of our stay! "Comfortable but needs some tweaking "
Spent a night here on drive across Europe. Comfort rooms are large with free mini bar which is nice touch. Basement pool is great after a long drive. The steakhaus served delicious steaks and sides which while not the cheapest was reasonable at 25 euros for a perfectly cooked 350gr rib eye steak. The hotel is across the road from the station and a shopping centre so great location. Improvements, the rooms were hot which was a shame as the beds were great, and one of our rooms had a cracked sink. We would stay here again. I stay on a regular basis in this hotel and I love it. The employees are very accommodating to any needs. The rooms are clean and equipped with flat screen TV, phone and mini bar/refrigerator. The mattresses are very good. High speed WIFI with sufficient reception is available throughout the hotel. Sometimes I use the business center in the lobby which provides a computer and printer. Breakfast is probably the best I've ever had in a hotel. Fresh croissants and kaiser rolls, assortment of bread, eggs to order, hot German sausage, fresh fruits, cereal, yogurt and a lot of bread spreads to choose from as well as cheese and other goodies. Coffee, latte macchiato, cappuccino and hot chocolate are very tasty. Juice and a huge selection of tea is also available. I highly recommend the Best Western Leverkusen. It is always a pleasure to stay there. Stayed here for one night. Very welcoming staff. Decor stuck in the 1980s. Room accessed by an old style metal key. No ac in room, but two fans supplied. Free mini bar a nice touch. Very clean room, good shower, old fixtures etc. No ironing board in room or safety deposit box. Free WiFi easy and fast. Bed firm but OK. No gym, but nice pool if not very big. Good breakfast, though hot food selection is small. Fine if you like cold meat and cheese, yoghurt and baked goods. Overall perfectly fine for a short stay. We stayed overnight at this hotel on our way to Austria with National Holidays. Hotel is a bit dated but was fine. Room was clean and spacious with large flat screen TV and 2 queen size beds. Breakfast was excellent, lots of choice and good quality items. 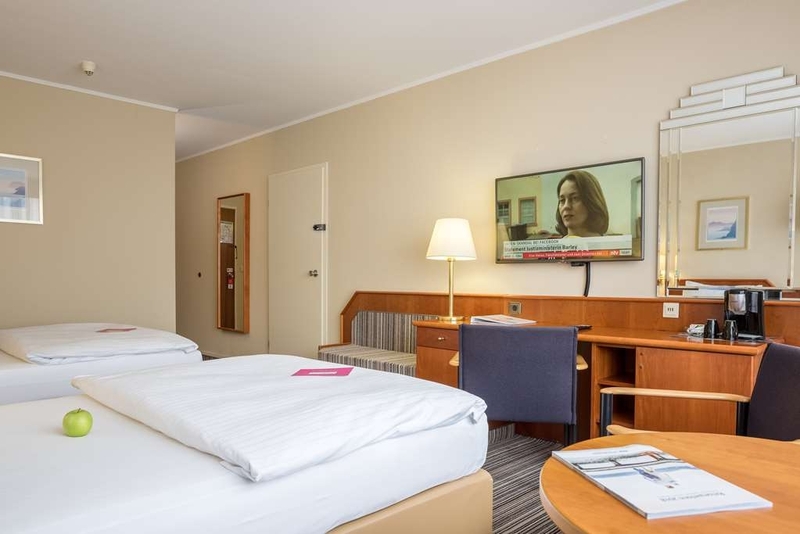 Hotel is in a great location just minutes from the centre of Leverkusen which is a nice little town with plenty of shops and restaurants. Hotel has a swimming pool and also offers the opportunity to use a nearby gym for free but unfortunately we did not have the time to use these facilities. Would definitely recommend this hotel. Four night stay in December. Good central (but quiet) location. Reasonable rooms. Nice, if small, bar with an excellent on-the-ball but very hard pressed (2/3 coachloads of guests at once !) bar lady. Food, ambience, organization and service at dinner was, frankly, terribly poor. Think school dinners and refectory. Such was the disappointment our operator gave a discount because of the complaints received from the majority of the tour party. However,as our personal approach is normally to eat out we did so. Discovered a splendid Christmas Market in the bustling town centre close by. So this compensated. 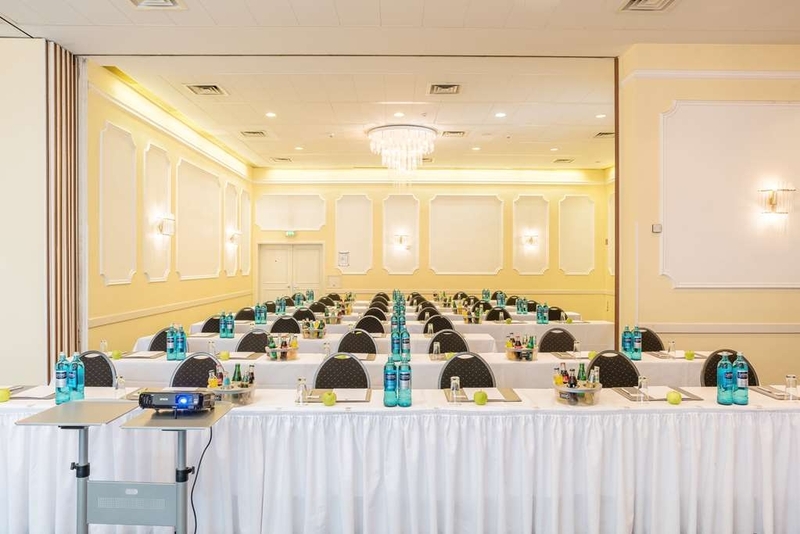 Hotel overall is of reasonable standard (dinner arrangements for coach parties excepted !) as long as the expectations of being on a bus tour at the height of the Christmas Market season are taken into account. In this respect, the advent and consequences of overnight stop bustour traffic in ANY hotel - not just this one - regrettably is now universal and engenders a "push 'em through" attitude in some management approaches.